Life is hard and unpredictable. Things happen that are almost too much to bear….and for some people sometimes they ARE too much to bear…..which can lead to behaviors that are self-destructive or even to death at their own hands. Where would we be without faith? I don’t know about you, but I would not be standing here this morning if it weren’t for my faith in God’s great love, God’s grace, God’s outrageous generosity. I think of the times in my own life when my faith had pretty much withered away and how my attitude had gotten so bad because of it. I thought everything was about me. I thought of all the things I was entitled to, but didn’t have. How I gave in to despair. How I succumbed to depression. Take a moment right now and think back over your life or even this present moment to recall a time when you’ve been like this–when you have felt these things or something similar. I don’t know about you, but when I’ve examined my life and looked at those dark times, those hopeless times, those uncomfortable times, the same thing keeps coming up. The same through line runs through all those different times of my life. And it is this: I had no gratitude. None. And that’s what we’re here to talk about this morning. Gratitude. And the most miraculous thing that occurs when we ARE thankful. So, why don’t we look together at Luke 17:11-19 and see what is in it that can help us to live more fully and to be of greater service. As you know this is called the Story of the Ten Lepers and only appears in Luke. So here we have Jesus, who’s been busy ministering and proclaiming the word for nearly three years and once again he’s making his way to Jerusalem. The end of his time is fast approaching and he knows it, but he still has a lot to do. Jerusalem is still quite a way’s away. Maybe he’s going through that region in order to get to the River Jordon and then go down to Jerusalem. I like how Luke places Jesus in a place that isn’t here or there. It’s an “in-between” place. He’s a Jew from the place on one side. Jews were not allowed to mingle with Samarians who were considered unclean and irreligious. Jews were not allowed to have dealings with them. Remember the story of the Woman at the Well? She was Samarian. So Jesus is neither here nor there. I don’t know about you, but that makes me feel uncomfortable just thinking about it. I don’t like when I’m in a situation like that. How about you? It’s like leaving home and being driven to the airport. Once you’re dropped and go through security you’re no longer in your home city or area, but you’re not yet at the place to which you are going. You’re in between places. Think of what that might mean. How that might make you feel? You can’t do the same things you can when you are one place or the other. The same rules don’t apply. You can’t count on the same things. So, here we have Luke putting Jesus into that slightly unsettled place. Sets up the story nicely. Let’s move on. Whoa! Here we have him walking through an in-between place and then entering a village he did not know. And all of a sudden not one, not two, not three, but TEN lepers start coming toward him. I don’t know about you, but if that happened to me I think I’d probably turn around and get out of there. But no, Jesus just stands there waiting. Keeping their distance, they called out.. This is very telling. Because they had leprosy they had to live away from others. And apart from their families. They smelled. They were required by law to dishevel their hair and tear their clothes. They were outcasts forced to beg in order to survive. They knew not to get too close to anyone, in this case, Jesus, so as to not frighten them away and thus lose the chance to be given some money or food. So they stayed slightly away and then “called out” in order for Jesus to hear them. Imagine what that must sound like to us. I think of when I’ve been ministering in cities with large homeless populations and many panhandlers in one place, if ten of them would be together and had approached me all of them calling out at the same time..
..saying, Jesus, Master, have mercy on us! Tell me, how did they address Christ? Yes, Master. What does that imply? Yes, that they had heard of him, his teachings, and his power. Master is a term used in all cultures concerning learned women and men, especially religious and spiritual teachers. Someone who has mastered something. Think Yoda, the Jedi Master from Star Wars. So, they are addressing Jesus as one whom they acknowledge as having power—power over death, power to heal, power to see beyond the limitations of this world. And then what do they say to Jesus? “Have mercy on us!” They didn’t ask for money or food or anything material, they asked for Jesus to have mercy on them. But, what does that mean? Help me out here: what does it mean to have mercy? (compassionate treatment, to be kind and forgiving, alleviation of distress.) So all ten of them, having heard of Jesus’ power, first of all, recognize him, and then come toward him and ask for his mercy. Let’s move on. In Leviticus there are extensive instructions about how priests diagnose leprosy and what must be done in order for one with leprosy to be made ritually clean. The priests, not doctors, would examine a person with a boil or eruption over the course of days and weeks and only a priest could then say a person no longer was leprous. So Jesus was obeying the law and sent them to see the priests. He told them what to do. DO. Something active. They obeyed. Nothing had yet happened. They had faith in Jesus and what he told them to do. But in order for the miracle to happen, the ten lepers had to turn around and start walking in faith before anything even had changed. Got that? They had faith. Faith that they would be made well. Faith that they would be made whole. Faith that something would change for the better. Walking in faith. Then, get this: And as they went, they were made clean. Wow! They were made clean! A miracle happened! And why did it happen? Because of their faith. Can’t you just see them? They suddenly had their fingers reappear, their open boils and wounds disappeared and they again had unblemished skin. They had mobility because of their feet healing. They probably skipped and ran caught up in the excitement of once again returned to their former state of being. But then one of them, when he saw that he was healed, turned back, praising God with a loud voice. Like the others, he realized what had happened and was amazed at being made well, but instead of skipping off, he turned around and started walking back to Jesus and while doing so praised God. And in a loud voice. Not a soft voice. But a LOUD voice. He must have been shouting at the top his lungs. This morning’s Psalm is just one of the many, many psalms that tell us, admonish us really, to praise God for His blessings. It said, “Make a joyful noise to God, all the earth; sing the glory of his name; give to him glorious praise.” Glorious praise! So this is what the tenth leper did: praised God. He prostrated himself at Jesus’ feet and thanked him. Now that he found himself to be ritually clean he was able then to approach another person. So did he just saunter over to Jesus and say, “Hey, thanks?” No, what does it say? He PROSTRATED himself at Jesus feet. Now that’s humility. That is a way of acknowledging the Jesus is God incarnate. He went down on his knees and put his head facedown at Jesus’ feet, in the dirt, and gave him all honor and praise. He was so filled with gratitude that he was able to do this. Here Luke is raising the stakes. The man was an outcast. His religious beliefs—his faith—were held by the Jews to be inferior. He wasn’t supposed to associate with Jews. Even Jewish lepers. That’s how much of an outcast he was. And it was this man who is held in low esteem that is the one to praise God and thank Jesus. And now, I really like this: Then Jesus asked, “Were not ten made clean? But the other nine, where are they? Was none of them found to return and give praise to God except this foreigner? I love this. He’s wondering where the other nine people were. They’d been healed, but did not thank him or thank God. It brings up for me how painful it can be to be an unthanked healer or giver. Any of you parents out there relate to this? Or teachers? Or nurses? So much of the time when we perform our own little miracles, when we help to make someone better, or move them toward wholeness they incorporate the change so quickly into themselves that it becomes the “normal” again so they seemingly forget what it was that just happened and how it was that you were able to assist them in their need. That can hurt. 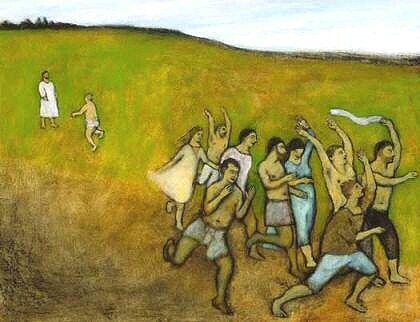 Jesus must have looked at the nine lepers running away to go see the priest reveling in their newfound health and anticipating what they would now be able to do, how they would be able to re-enter their communities and be reunited with their loved ones and neighbors. Maybe for a moment he felt just a bit of resentment. But I get how they were feeling. Sometimes we don’t want to even look back at what we’ve just survived let alone TURN back and acknowledge the power that allowed us to escape from it. We don’t want to be reminded of our old selves or to think about how much worse things could have become. Even the guy that was healed. Think about how his world now has been turned upside down. Before he was hanging with nine foreigners and together they took care of each other, they got by begging for money and food. And now he’s on his own. He’s been cured of his infirmity—his leprosy—so wouldn’t be able to beg. What’s he going to do? He’s been healed. That’s a little scary. It means having to create a new identity and a new way of life. Now this a rather perplexing statement. Jesus didn’t claim to have made him well or as it is in the original Greek—“delivered you.” But that the man’s own faith had made him well. How can that be? There are many of you here today, and I as well, who have a lot of faith, and in spite of that we haven’t been able to cure ourselves or to facilitate the healing of others. What it seems here with the Samaritan—the tenth leper—is that because his faith was so great, it allowed what Jesus saw him as—that is: disease-free, unentangled, and whole—to manifest itself physically. There are times when another pastor says something like that I get a little mad, because that hasn’t always been my experience with myself, my loved ones, and with my parishioners. I have to step back a little bit and get away from my emotions; away from my own wishes, wants, and desires and see the bigger picture—to see how things work. Usually when a calamity or illness befalls us we know exactly what to ask for in our prayers: for that calamity or illness to be taken away. We petition God. We use a “cause and effect” model: if we pray for this then that will happen. But as we all know, that’s now how God works. That’s not how Jesus worked, either. He didn’t roam the countryside forcing healing upon anyone and everyone. He healed those who were ready to be healed. And so it is our job, my sisters and brothers, to ready ourselves; to make ourselves open to whatever is possible for God to do, acknowledging that we may not know what that is, that we may not be able to see or understand because of our limitations what those things are and even if healing has occurred. What we are asked to do is to always be giving thanks, always praising God. It’s living a life of gratitude that constitutes living a life of faith. A few minutes ago I recounted how the disciples asked Jesus to increase their faith, as though faith were something that Jesus could put into a vessel and they then drink of it. No, faith always—ALWAYS—resides within us. It doesn’t come from anywhere else. Don’t confuse it with Grace, which is unearned and is poured down upon us by the Holy Spirit. We don’t have to go searching for faith, faith resides within us. It may seem small. It may seem to ebb and wane. And sometimes it may not seem even to be there at all. How we INCREASE faith is by living a life of gratitude. And living a life of gratitude constitutes living a life of faith. To practice gratitude is to practice faith. If we want to play a musical instrument more proficiently, or be better at a sport, or to do more complex needlework we have to practice; we have to do those things over and over again in order to increase our skills and strengthen our abilities. So too with gratitude. Put some gratitude in your attitude and how you perceive things will change. I know that sometimes that is really difficult. Sometimes we deal with stuff that’s really scary. Things that can have dire consequences. But, it’s our job as Christians, as people of faith, to always find something for which to thank God. In the early days of AIDS I had a friend who went blind. I thought he would be angry and full of resentment towards God for taking his sight. But, instead, when someone would say about how awful it was for him to not be able to see he would say, “Yes, I don’t like it, but I’m thankful that I can still hear.” Gratitude.